This large, thick, mature and beautifully colored Hawaiian Sunrise Shell has a blend of pink, yellow, green and white, Hawaiian colors of the rainbow! A silver bead cap from Bali sits atop a North Shore Puka Shell adding the final "Bali County touch" to the Sunrise Shell pendant, which drapes from a natural colored twisted waxed cord 18 inch necklace, and has a Puka Shell and loop closure. This beautiful Sunrise Shell has a very well defined growth ring and ruffle at the scallop edges, and is generously sized at 1 3/8 inch! Perfect for either a man or woman, and to be worn with Aloha and a smile! 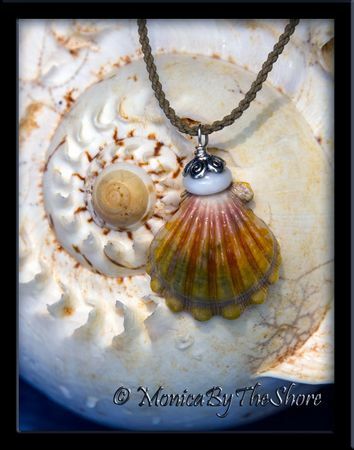 And don't be afraid to wear it in the ocean, these shells love the surf! 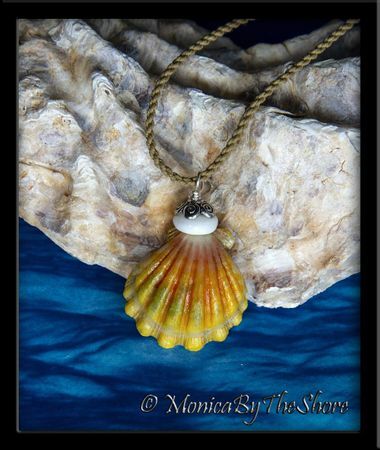 An original MonicaByTheShore Sunrise Shell design, simple, natural beach seashell jewelry from Oahu, Hawaii. Hand crafted with Aloha, one piece at a time, in Haleiwa, on the North Shore, and Honolulu, Hawaii.